How to Get Rid Of Scars on Legs? : Do you love those pretty lil dresses, but shy away from wearing them because of scars and wounds on your ankles and legs? This is every pretty damsel’s biggest woe! But truly, getting rid of scars on the legs is no herculean task. A few kitchen ingredients and a whole lot of patience are all you need to banish these scars naturally. FYI, most of the commercial scar removal creams are usually a mixture of Vitamin E, moisturizers and fillers that may work on the scars, while others are just a hoax. So if you are looking for a remedy to treat scars on your legs, simply rummage through your kitchen rack! Here is a list of tried and tested home remedies to get rid of scars on legs. They will not just clear the scars, but also leave your skin soft, nourished, supple and good as new! How to Get Rid Of Scars on Legs? How to Get Rid Of Scars on Legs Naturally with Home Remedies? A natural cure for scars on legs, yogurt is all you need if you are ridden with scars on your legs. When yogurt is applied to scars and burns, it cools down the skin rapidly, which in turn makes the wound heal faster. As a result of this, scars may visibly lighten and the burn’s intensity will be drastically reduced. How to use it: Apply yogurt everyday onto the affected areas of your skin. You can also make a paste out of yogurt, barley and turmeric. Taking equal amounts of the three ingredients, apply the paste onto the scarred and wounded areas. Another very efficient way to get rid of scars on your legs is by using fenugreek seeds. It works wonders on scars that are caused as a result of a burn. Fenugreek seeds have anti-inflammatory properties that work miracles on scars generally. It is also a great skin coolant, thus is effective to ease the damage caused by a scar left from a burn. This will in return help to reduce the burn’s visibility to a great degree. Throw in a handful of fenugreek seeds in water and let it soak overnight. In the morning, grind the seeds to make a paste and apply this onto your scars on a regular basis. Must read: How To Get Rid Of Acne Scars Naturally? Lemon juice is no less than a blessing when it comes to treating scars caused by burns, operations and accident cuts. Lemon juice boasts of acidic properties, which play a major role in fading away all scar wounds. However, keep in mind that the juice can make your skin sensitive to light. So do use a sunscreen if you happen to be stepping out in the sun, while under this treatment. How to use it: Soak a cotton ball in some lemon juice and gently massage it onto your scar. After a while, wash it off with water. Perform this procedure twice a day for better results. Rosemary oil is a lifesaver for minimizing scars on legs instantly. The medicinal properties encompassed in rosemary oil help to reduce the appearance of scars while the antiseptic and antibacterial component in the oil heals the scars and burn marks without any side effects. How to use it: Take rosemary oil on a cotton ball and apply it onto the wounded area. Leave it on for around 15 minutes before you rinse off. Raw honey can be used for the purpose of decreasing the visibility of scars and burns on your entire body. Honey stimulates the regeneration of skin tissue and moisturizes the skin, hence is helpful in the treatment of wounds. How to use it: Blend two tablespoons of baking soda and honey in equal quantities, massage it onto the wound for three minutes. Later place a warm towel over the affected area. Once the towel cools down, use it to wipe away the honey mixture from the wound. Also read: How to Get Rid of a Hickey? Using tomato as a natural remedy for scars is the simplest and fastest way to diminish and minimize spot visibility on your legs. The antioxidants present in the tomato remove dead skin cells and help to rejuvenate the skin. How to use it: Slice a tomato and apply it onto your scar for 20 minutes. Alternatively, you can also extract, tomato juice and rub it onto the scar everyday so that your scar disappears within no time. Papaya is no less than a treat to the hungry. Its tasty, succulent flesh melts in the mouth like no other fruit. Apparently, this fruit has also been used since time immemorial in treating myriad skin conditions. If you are on the lookout for a remedy for stubborn scars on the legs, you just need to try papaya. The pulp of fruit can help reduce the visibility of scars and burns on your legs and ankles. The enzymes present in papaya aid in restoring and rejuvenating skin cells that are affected due to a wound. It also helps you acquire an even skin tone. How to use it: Peel a papaya and extract its juice. Apply this juice onto the scars to watch them subside within a few weeks. This tiny green plant can help improve immunity, improve hair growth, reduce blood cholesterol and even ward away cancer. You can also use aloe to naturally reduce the appearance of ghastly scars on your legs. Aloe vera repairs damaged skin cells, minimizes swelling and removes dead skin. The anti-inflammatory properties reduce skin irritation and strengthen new cells that are produced. How to use it: Aloe is available in many forms, including ointments, lotions and gels that can be used daily on the affected area. You can also massage freshly extracted aloe vera gel directly on the scar tissue several times a day. Whole milk is also effective to get rid of scars on your legs naturally. The lactic acid present in the milk acts a natural exfoliant which thus helps to diminish scars. How to use it: Simply apply whole milk onto the scars every day in the morning and you will notice the scar fading like a miracle. Be sure to consume a diet that is rich in vitamins A and C.
Try not to expose your scars to direct sunlight as it may leave a permanent mark on your skin. Avoid using ointments immediately on heat scars as it may cause further harm to the wound. Once the wound is healed, gently massage the scar as it will break up the collagen and reduce the size of the scar. 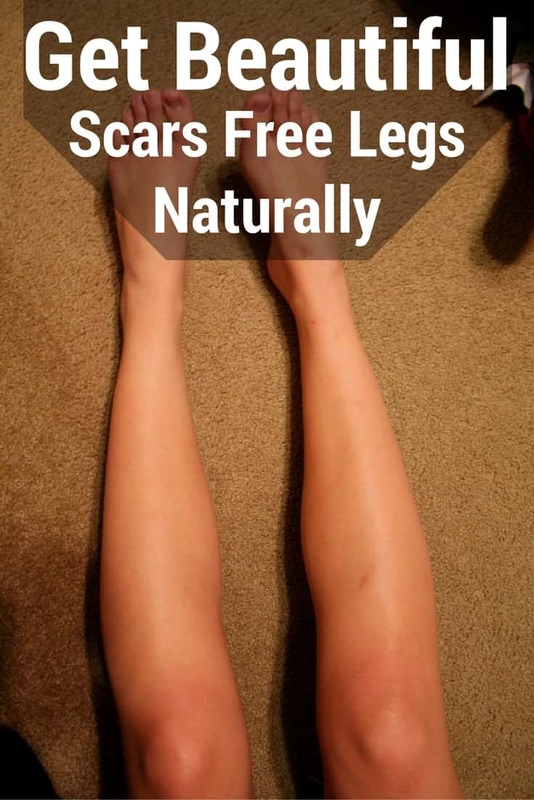 Now that you know a few ways in which you can naturally cure scars on your legs, do not hesitate to give them a try. These remedies will give you flawless legs that you can flaunt without having to worry about those battle wounds anymore.